Dogs are not the only animal humans have domesticated, which suggests that although dogs get all the attention, there’s reason to argue other species could also deserve the title of “man’s best friend”. Since the evolution of dogs from wolves tens of thousands of years ago, they have been selectively bred for various roles as guards, hunters, workers and companions. But dogs are not the only animal humans have domesticated, which suggests that although dogs get all the attention, there’s reason to argue other species could also deserve the title of “man’s best friend”. Anthrozoology, the study of human-animal relationships, has established that dogs demonstrate complex communication with humans. Charles Darwin thought that dogs experienced love, but it was only in 2015 that Japanese scientists demonstrated what we all intuitively knew. Miho Nagasawa and colleagues sprayed the “love hormone” oxytocin up dogs’ noses, measured the loving gaze between dog and human, and then measured the oxytocin levels in the humans’ urine, finding them to be higher. Rest assured, dog owners, that science has verified your bond with your faithful hound. Horses also show intentional communicative behaviour with humans, and another recent paper published in the Royal Society’s Biology Letters from researchers at Queen Mary University of London has shown that goats also demonstrate an affinity with humans. The experiments tested goats’ intelligence and ability to communicate with humans. What the team found may come as no surprise to anyone who has worked with livestock: goats are highly intelligent, capable of complex communication with humans, and are able to form bonds with us – treating us as potential partners to help in problem-solving situations. Our attitudes to animals tend to reflect the familiarity we have with them. Dogs score higher in perceived intelligence ratings than cows, for example, yet a study in the 1970s demonstrated that in a test cows could navigate a maze as well as dogs, and only slightly less well than children. The point was made that our perception of an animal’s ability is influenced by how we test them. A pertinent example is the study by trailblazing tortoise Moses and his co-worker (owner) Dr Anna Wilkinson. Tortoises performed poorly in “intelligence” tests in the 1960s, but Wilkinson identified that tortoises do not perform well when cold. The pair subsequently demonstrated advanced inter-species communication in gaze-following tasks, as is documented as a marker of intelligence in primates and also was used as one of the goat intelligence tests. Perhaps tortoises could be man’s BFF – best friend forever. They do live for a long time. As humans are inclined to like animals they know – and believe them to be more intelligent – many farmers speak highly of livestock. 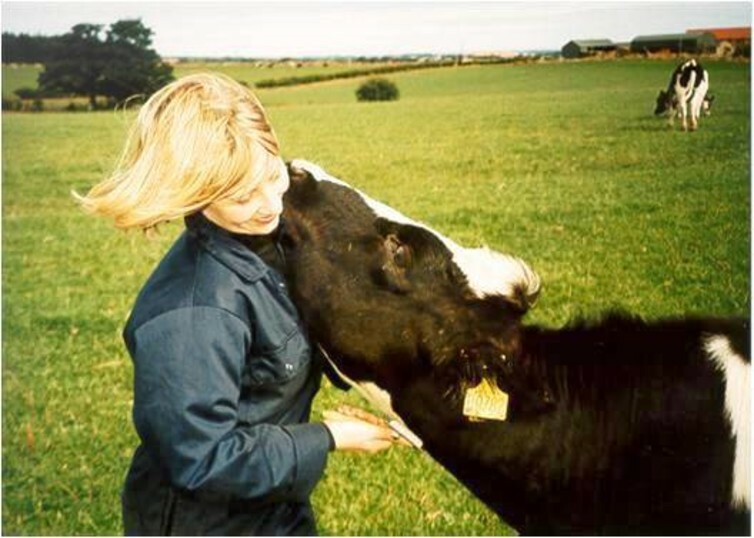 In our Newcastle University study, we found that more than half of dairy farmers surveyed loved their cows – something made apparent by the grief farmers felt when their herds were culled during the 2001 foot and mouth crisis. But do their cows love them back? In order for a human-animal relationship to develop, animals must have little fear of humans, and the time they spend with humans must bring a high proportion of positive experiences. Our complementary study investigated the effect of positive treatment by humans on cow milk yield and behaviour. To validate that the cows felt positively about the experience, we used a standardised stroking test to see if they kept coming back for more. This confirmed most of our cows enjoyed this human contact. Having worked with cows and lived with dogs, I can confirm that cows are much like big dogs with udders. In 2015, French researchers showed that sheep are also fond of positive interaction with humans – just like dogs, their ears go a bit floppy when they’re stroked. We still don’t know the abilities of our potential friends in the animal kingdom beyond those few species we’ve domesticated. Over a hundred diverse species have been found to display intelligence and personalities, from the octopus to the rhinoceros (although a rhinoceros is not recommended as “man’s best friend” on health and safety grounds). Many creatures demonstrate amazing feats of intelligence and communication, if only we can develop the techniques to ask them. For example, Irene Pepperberg has spent 30 years working with Alex, her renowned grey parrot, who was able to communicate to us how much a bird understands. Or the discovery that rats like to be tickled and in fact laugh – only at a frequency inaudible to humans. Sheep can recognise photos of other sheep and humans, and can use these pictures to interpret their mood, consistently outperforming dogs in this task. Pigeons can outclass first-year art degree students in distinguishing between a Manet, a Picasso and a Monet. What have pets ever done for us? Researchers from the University of Bristol believe keeping pets is a fundamental human trait, something we benefit from in return. Research compiled in The Dogs Trust’s Canine Charter for human health reveals the health benefits of pet ownership, including a survey of doctors which found that, if it were possible, an overwhelming number of GPs would prescribe a dog for many medical conditions. Florence Nightingale promoted the healing benefits of pets, and if I recall correctly used to carry an owl around in her pocket (how the owl felt about that is not recorded). It is reassuring to know that goats are intelligent and can elicit help from humans when needed; to my husband’s shame that puts goats ahead of him on the evolutionary ladder as he is not prepared to ask for directions when lost. Will goats topple dogs for the position of man’s best friend? I think a rerun of my favourite experiment with goats would be the ultimate test: French researchers demonstrated that men out walking their dogs are more successful at getting women’s phone numbers than those without a dog present – a true best friend. Sadly, anthrozoology is not a well-funded field of inquiry, and this and many other interesting questions posed by such research will likely go unanswered. This article was originally published on The Conversation and republished here with. Read the original article.